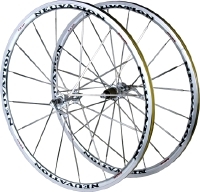 Neuvation Cycling is introducing three new wheel models. The two R series models feature lightweight 420 gram 27 mm V section aluminum rims, alloy hubs that can be easily switched between Campy and Shimano cassette bodies, and Pillar spokes. The R28 Aero has 5 mm aero bladed spokes, weigh 1570 grams per set, and have a SRP of $499. The R28 SL has triple butted non aero spokes, weigh 1470 grams, and also have a SRP of $499. Both come with skewers, rim strips, and extra spokes. Also new is the 1170 gram C38 carbon tubular wheels featuring 38 mm deep V US made, carbon rims, and Sapim CX Ray spokes -- some of the best and most expensive spokes in the world. They have a SRP of $1499. All Neuvation wheels are 100% hand-built using high and equal tension. Neuvation Cycling will be showing these and current models in the Neuvation booth #1413 at Interbike. For more information contact John Neugent at Neuvation Cycling. Toll free 877-222-4519, fax 413-480-3024, or e-mail John@NeuvationCycling.com.